In my food science lab not too long ago, we made potato salad. Our professor noted that red potatoes are optimal for potato salad due to their low starch and high moisture content, which allow them to hold their shape better than, say, russets. It made sense, but I found it amusing because the thing I like best about red potato salad is smashing it up?and thereby ruining whatever shape the potatoes have held. In any case, I love the moisture and lightness of red potatoes, and I couldn’t resist sharing my new favorite recipe for them as we head into Memorial Day weekend. 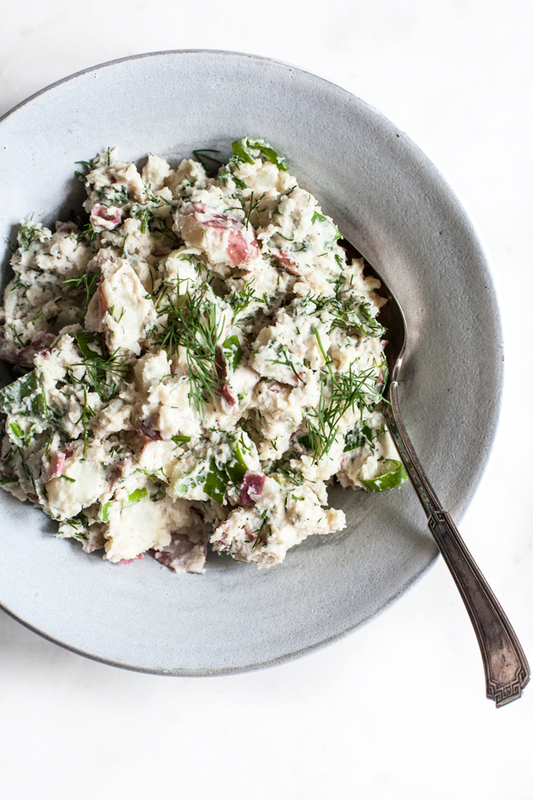 This red potato salad with creamy cashew dill dressing & dill is easy to prepare, flavorful, and a little more nutritious than the traditional potato salads you might find at potlucks or cookouts this weekend. As we were breaking down the intricacies of starch molecules, our professor paused to tell us about the many heated debates that have broken out in her lab regarding the proper way to make a potato salad. It’s cultural, she said: students who have grown up here might have very different opinions than students with German heritage, or students from Scandinavia.